It is good to see housing high on the policy agenda. That is where it should be. 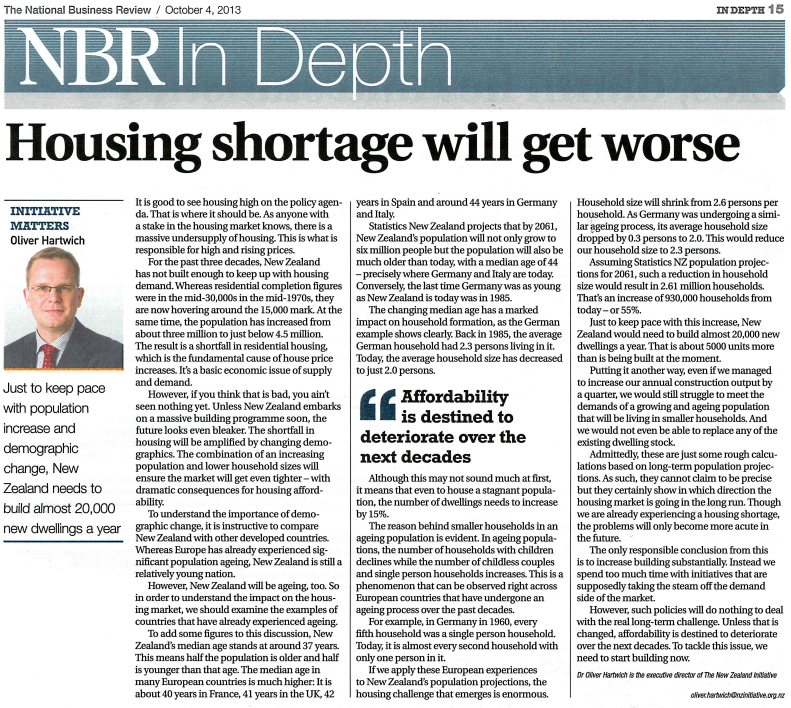 As anyone with a stake in the housing market knows, there is a massive undersupply of housing. This is what is responsible for high and rising prices. For the past three decades, New Zealand has not built enough to keep up with housing demand. Whereas residential completion figures were in the mid-30,000s in the mid-1970s, they are now hovering around the 15,000 mark. At the same time, the population has increased from about three million to just below 4.5 million. The result is a shortfall in residential housing, which is the fundamental cause of house price increases. It’s a basic economic issue of supply and demand. However, if you think that is bad, you ain’t seen nothing yet. Unless New Zealand embarks on a massive building programme soon, the future looks even bleaker. The shortfall in housing will be amplified by changing demographics. The combination of an increasing population and lower household sizes will ensure the market will get even tighter – with dramatic consequences for housing affordability. To understand the importance of demographic change, it is instructive to compare New Zealand with other developed countries. Whereas Europe has already experienced significant population ageing, New Zealand is still a relatively young nation. However, New Zealand will be ageing, too. So in order to understand the impact on the housing market, we should examine the examples of countries that have already experienced ageing. To add some figures to this discussion, New Zealand’s median age stands at around 37 years. This means half the population is older and half is younger than that age. The median age in many European countries is much higher: It is about 40 years in France, 41 years in the UK, 42 years in Spain and around 44 years in Germany and Italy. Statistics New Zealand projects that by 2061, New Zealand’s population will not only grow to six million people but the population will also be much older than today, with a median age of 44 – precisely where Germany and Italy are today. Conversely, the last time Germany was as young as New Zealand is today was in 1985. The changing median age has a marked impact on household formation, as the German example shows clearly. Back in 1985, the average German household had 2.3 persons living in it. Today, the average household size has decreased to just 2.0 persons. Although this may not sound much at first, it means that even to house a stagnant population, the number of dwellings needs to increase by 15%. The reason behind smaller households in an ageing population is evident. In ageing populations, the number of households with children declines while the number of childless couples and single person households increases. This is a phenomenon that can be observed right across European countries that have undergone an ageing process over the past decades. For example, in Germany in 1960, every fifth household was a single person household. Today, it is almost every second household with only one person in it. If we apply these European experiences to New Zealand’s population projections, the housing challenge that emerges is enormous. Household size will shrink from 2.6 persons per household. As Germany was undergoing a similar ageing process, its average household size dropped by 0.3 persons to 2.0. This would reduce our household size to 2.3 persons. Assuming Statistics NZ population projections for 2061, such a reduction in household size would result in 2.61 million households. That’s an increase of 930.000 households from today – or 55%. Just to keep pace with this increase, New Zealand would need to build almost 20,000 new dwellings a year. That is about 5000 units more than is being built at the moment. Putting it another way, even if we managed to increase our annual construction output by a quarter, we would still struggle to meet the demands of a growing and ageing population that will be living in smaller households. And we would not even be able to replace any of the existing dwelling stock. Admittedly, these are just some rough calculations based on long-term population projections. As such, they cannot claim to be precise but they certainly show in which direction the housing market is going in the long run. Though we are already experiencing a housing shortage, the problems will only become more acute in the future. The only responsible conclusion from this is to increase building substantially. Instead we spend too much time with initiatives that are supposedly taking the steam off the demand side of the market. However, such policies will do nothing to deal with the real long-term challenge. Unless that is changed, affordability is destined to deteriorate over the next decades. To tackle this issue, we need to start building now.